At 4am my eyes opened. The sound of the rain dancing on the hurricane shutters had gotten loud enough to bring me out of a sleep. Then they closed. At 5am my eyes opened again. May as well get up since this time, the rain had been loud enough to awaken a formerly snoring McNab Dog, my own faithful sidekick, Lettie. After she had decided that she had enough of being petted and leaving a wet spot on my right elbow, I hauled my bulk out of bed and went in search of the computer for a check on the Radar. It has been raining since Last Thursday, and at this point, it is expected to rain until Thursday Morning. At least another day and a half of this mess. Don't get me wrong, I don't mind having moss grow on my North side. Neither does Lettie. There was a gap in the storms and we were able to get the first 1/2 mile of the walk done when I was shown that there is no such thing as a dumb animal, unless you count a half asleep human. She had decided that she had enough of walking in the rain and since McNabs were bred for intelligence and self-directed thought and action, my little furry free-thinker started walking toward my left or outside leg and nudging me gently toward the house. Being in Shorts in October, it was going up to 86 after all, I noticed quickly. One of the first things you do when you move home is to get your bearings. While doing that, you should get your dog used to the lay of the land and try to get her lost. With a McNab, it is impossible. Same, truth be told, of many of the other intelligent breeds like the Border Collie from which she was derived, as well as the Aussie Cattle Dogs, Blue Heelers, Kelpies, German Shepards, Poodles and the rest of the top ten list. Teach them well, give them a job, and they will do it. In fact if you have an intelligent dog, you are missing out on one of the most rewarding aspects of owning a dog, that feeling of partnership you get when a dog learns you and you learn the dog and all is right with the world. I've said many times that I could get home anywhere on the island as long as the dog is with me. She knows exactly where home is as long as she has watched where we are going. In a car it is doubtful although she does seem to recognize certain places nearby. 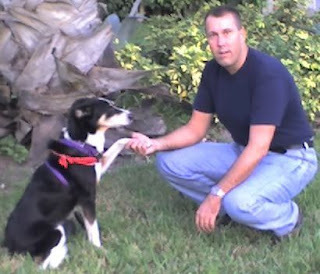 Being a herding dog, it is innate behavior to know how to guide animals that may be quite a lot larger than they are. I weigh about 4 1/2 times as much as she does. A simple damp furry brush against my leg and I made the turn laughing toward the house. She'd had enough and this weather had given me a sinus headache, it was time to go home. There is a story about the Border Collies in their natural region of the border lands of England and Scotland. When they know their job they are best left to it. A Farmer up there had a guest dog trainer from the US and was showing her around the farm and allowed her to meet the dogs. It was time for the sheep to come in, so the farmer told the dog "Get to work". Then the farmer said "Well fancy a cup of tea? He'll be back around noon". The dog then went out to the distant parts of the farm, gathered up all of the sheep and brought them back to the farm house, around noon, as planned. Never underestimate someone, no matter how small or how furry. You never know what they will do until they're challenged with the task.